What in the hell? Are your tongues made of stainless steel? Is the reason you must dump sriracha on everything because your morning coffee has burned your taste-buds into oblivion? Okay, sorry, I didn’t mean to come on so strong. But really, on Monday I met a recent graduate for a mentoring session at a coffee house, because that’s where you do such things. My typical morning beverage of ice cold Diet Dr. Pepper was not available (Oh God, yes I know drinking artificially sweetened soda is going to give me Alzheimer’s) and it was snowing out, so I decided to get myself a nice warm Earl Grey tea. I let the tea steep, added a smidge of sugar, put the adult sippy cup lid back on and took a tentative sip. I could feel the individual taste-buds searing off as the boiling tea traveled from my lips to my esophagus. This happens every…single…time I drink hot beverages. Seriously though, it had been 15 minutes since my tea was served, and I was starting to feel awkward not drinking while the student guzzled his coffee with apparent delight. I did not start screaming or rush to the barista to demand an ice cube – I am a grown up after all – but I wanted to. I’ve got to be some kind of weird mutant. My tongue must be made of some delicate recessive tissue which cannot withstand boiling liquids like the normal tongues of the 21st century. (I think it must have come from my dad’s side of the family, because he doesn’t drink hot beverages either.) 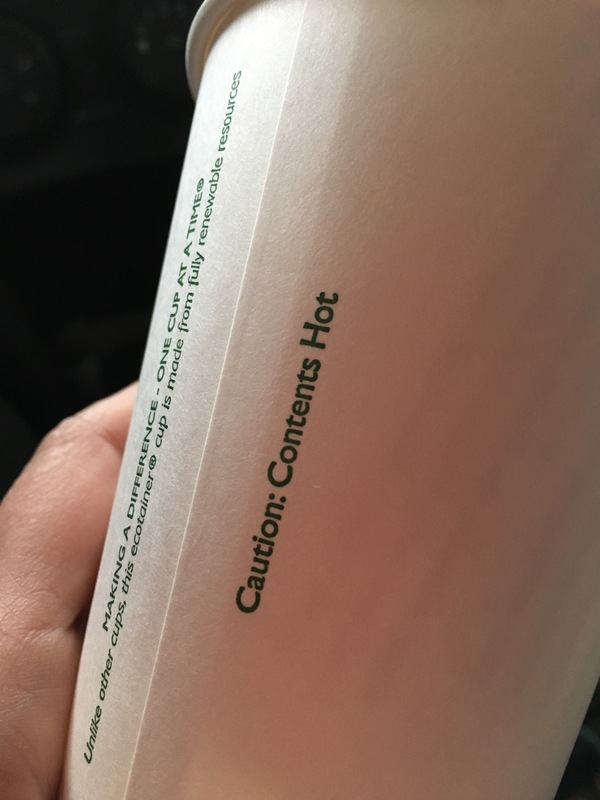 Every morning I witness hordes of coworkers drinking their cardboard sweater wearing beverage – because otherwise the cup is too hot to hold SO WHY WOULD YOU IMBIBE THE CONTENTS – and I wonder if I drink differently than others or is my physiology fundamentally flawed? It’s been three days since my hot beverage encounter. I can almost feel the center of my tongue again and am hoping my taste will fully return by Thanksgiving. Until then, I may have to become one of those weirdos who eats dressing on their salad. Maybe the sliminess won’t bother me so much without nerve endings in my tongue. Anyway, congratulations on your ability to drink hot beverages. Does this happen to you with every hot beverage or just tea? I don’t drink coffee, so I don’t know about that. It does happen with tea and hot chocolate though, especially when I get it from a coffee shop. At home, in an open mug, I seem to be able to drink tea without harming myself. I’m one of these freaks who asks for coffee to be made extra hot. And even then I feel like it could be a bit hotter. Extra hot? That’s a thing?!?! So then is your tongue just a solid mass of feelingless scar tissue? um, yes. else whatever comes to me is this tepid mass. I ask for things to be heated to 140 degrees. Hahaha. Love the cardboard sweater question! Kevin has to have it very hot in a thermal cup. I like it hot to start but will drink every drop even as it coasts to frigid (like the last sips I just downed). Ha! I’ve found that this only is with tea, especially at Starbucks. I have to leave the top off for about…15 minutes, and then it’s okay. It was totally Starbucks tea! I wonder why it is so burn-y. I may need to put my chemistry brain in gear and figure this out! In the meantime my tongue still hurts. I don’t drink coffee but I do love hot chocolate. I usually have to let mine cool off for a while otherwise it scalds my tongue. And I’m not a big fan of burnt off taste buds. The same with hot soup. Maybe we have wimpy tongues?